The following is the full text of the address made by Sinn Sinn Féin President Gerry Adams at the Mansion House in Dublin to his party’s 90th anniversary commemoration of the First Dail. A chairde, ar dtus ba mhaith liom failte on chroi a chur roimh gach duine don ocaid anocht. Is ocaid tabhachtach, speisialta e seo ina bhfuil muid ag ceiliuradh noacha bhliain on cead Dail Eireann. I want to thank everyone who helped to ensure that today’s commemorative event reflects the reality and spirit of that historic First Dail Eireann. Ninety years ago, Ireland was at the centre of great change. The Easter Rising of 1916 and the 1918 election had struck decisive blows against the British Empire. It was a time when nations across the world were recovering from the devastation of the First Great War. Many were demanding their freedom. It was also the time when the British and other colonial powers were carving up the Middle East and laying the foundations for the conflicts that rage today in Palestine and in Iraq. British imperialism has much to answer for. But here in this hall, 90 years ago, the Irish people, through their democratically-elected representatives, stood defiantly against that empire and declared independence. It must have been an emotional and joyous moment. Bhi suile na hEireann ar an ait seo ansin. Bhi dochas cosmhuintir Impir na Sasanna orthu fosta. Outside, the streets were crowded with thousands of enthusiastic people. Inside, this hall was packed to overflowing with visitors and journalists. The atmosphere must have been electric. I’m sure more than a few tears were shed as the roll call of TDs and the words ‘faoi ghlas ag Gallaibh’ rang out. Nach deas an rud da ndeanfainis a leithid! Sitting in this hall, participating in or listening to those first speeches of a free Irish nation - given entirely in Irish - and knowing that the Republic declared in arms at Easter 1916, had been ratified by the people: it was a defining point in Irish history. Not everyone who could have been here was here. The Unionist and Irish Parliamentary MPs refused to attend. Dhiultaigh siad glacadh le toil muintir na hEireann. And, of course, there were some 36 MPs being held in British prisons. But those who were here were fulfilling the Sinn Féin manifesto pledge of 1918 that it would establish a national parliament able to “speak and act in the name of the Irish people, and to develop Ireland’s social, political and industrial life, for the welfare of the whole people of Ireland”. The election had been hard fought. Ni raibh na Sasannaigh in Eirinn ro-shasta riamh le daonlathas don tir seo. There was massive intimidation by the British state. Over 100 candidates and activists were jailed, election material was confiscated and republican newspapers banned. However, the courage of those who took up arms in 1916, the public anger at the executions of the leaders, and the Sinn Féin manifesto for change, resonated with the voters, many of whom - particularly women voters - were going to the polls for the first time. The only woman elected in Ireland and Britain was Constance Markievicz for Sinn Féin. She became Minister for Labour in the First Dail, one of the first women government ministers in the world. The 1918 election was the last occasion on which the people of this island of Ireland voted in a single election. 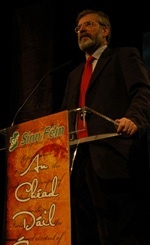 The landslide victory for Sinn Féin was an overwhelming endorsement of the desire for an independent and united Ireland. Nior choir dearmad a dheanamh air seo. Creidim go bhfuil an fonn sin, fonn na saoirse ag muintir na tire seo go foil. The inaugural meeting of the First Dail Eireann, here in the Mansion House on January 21st 1919, was an unequivocal act of national self-determination. Ta an t-eileamh sin beo go foill. It was also the day in which the first shots were fired at Soloheadbeg, in County Tipperary, in what became the Tan War. In the course of that first meeting, Dail Eireann issued a Declaration of Independence and a ‘Message to the Free Nations of the World’. In its message to the world it called on every free nation “to support the Irish Republic by recognising Ireland’s national status”. Spreag na focail seo pobal na hEireann agus daoine eile ar fud an domhain chomh maith. In words that reverberate today for those throughout the world still struggling for freedom and justice, the internationalist message of the First Dail Eireann was unambiguous. It stated its belief in “freedom and justice as the fundamental principles of international law” and in a “frank co-operation between the peoples for equal rights against the vested interests of ancient tyrannies”. And it asserted that peace can only be established by “the control of government in every land upon the basis of the free will of a free people”. Today, Sinn Féin stands with those who seek freedom and self-determination. We support the peaceful and democratic resolution of international disputes. We welcome the recently-announced ceasefire in the Middle East. But let me be very clear. Caithfidh muid bheith direach fa seo. The Israeli assault on Gaza and the slaughter of over a thousand Palestinians, many of them children, was an outrage. Caithfidh deireach theacht leis an coimhlint i nGaza, caithfidh cainteanna fiuntach tharlu ansin idir achan phairti gan mhoill. Ta Sinn Féin ag iarraidh Sos Cogaidh anois. It is now time that the conflict between the Palestinians and Israel was brought to a permanent end. There must be direct dialogue. And that will require a real and unrelenting international effort to construct a durable peace settlement which provides for two states, including a Palestinian state that is sustainable and viable. Ag pilleadh ar cheist na hEireann aris. The First Dail Eireann also set out a visionary Democratic Programme of social and economic goals based on equality. It declared that Irish society would be “ruled in accordance with the principles of liberty, equality and justice for all”. Ta na focail uilig seo, agus an meid seo leanas tabhachtach inniu. The Democratic Programme also stated that the sovereignty of the nation “extends not only to all men and women of the nation, but to all its material possessions, the nation’s soil and its resources, all the wealth and wealth-producing processes within the nation, and we reaffirm that all rights to private property must be subordinated to the public right and welfare”. It declared “the right of every citizen to an adequate share of the produce of the nation’s labour”. The Democratic Programme promised a new scheme of social welfare that would ensure that the aged and infirm would “no longer be regarded as a burden but rather entitled to the nation’s gratitude and consideration”. The Republic also had the duty to “safeguard the health of the people”. It pledged to build Ireland’s economy and reinvigorate industries, which would be developed “on the most beneficial, progressive, co-operative industrial lines”. Nach deas na foclai sin, ach is mor an trua nach bhfuil an rialtais i mBaile Atha Cliath a cuir i bhfeidhm iad sa la ata inniu ann. These are great words, reflecting the social and economic intent of the 1916 Proclamation and espousing the fundamental principles of freedom and democracy and social justice to be found in other similar declarations of independence around the world. They are great words that speak directly to the challenges facing Ireland today, a place where British jurisdiction continues. A place where partition has distorted and stunted the economic and political potential of the island. A place where unemployment, poverty and homelessness are on the rise. A place where too many citizens are on low wages; where there is inadequate protection for workers, poor public services and infrastructure, and much more. Cen sort fis e seo do phaisti agus sliocht na gceannairi o na laetha ud? This is not the Ireland envisaged by the 1916 leaders or by those who met in this building 90 years ago. Yesterday, the Oireachtas met in this room. That was a good and necessary event. It should have been here today on the actual date of the inaugural meeting of the First Dail. The problem is, no one in the Government remembered until the last minute and when they went looking for the use of this space, Caoilfhionn Ni Dhonnabhain and Dawn Doyle had already booked the Mansion House on behalf of Sinn Féin. I’m sure that news was well received in Government Buildings. ‘That might be setting the bar too high,’ I was told. And it was. So there you are. I suppose you could say yesterday was the provisional event. Today is the real deal, though I regret that the Taoiseach, Brian Cowen, representing the South, and the joint First Minister, Martin McGuinness, representing the North, are not here today to co-celebrate this anniversary of An Chead Dail. But the Minister for Agriculture, Michelle Gildernew; the Minister for Regional Development, Conor Murphy; the Minister for Education, Caitriona Ruane; Junior Minister Gerry Kelly; along with our MLAs, are all here with the joint First Minister, Martin McGuinness. Side by side with our leader in Leinster House, Caoimhghin O Caolain, TDs Martin Ferris, Arthur Morgan, Aengus O Snodaigh; Senator, Pearse Doherty; our MEPs Mary Lou McDonald, Bairbre de Brun and Sinn Féin councillors from across the 32 Counties are all gathered here tonight. So, Martin, you are not on your own. But it is hardly surprising that the political elites behave as they do. The First Dail was suppressed and Ireland was partitioned. No one should be surprised at the way the 26-county state has developed. And so it has come to be. New political managers and the business interests they represented came into the ascendancy. The declarations of social intent in the 1916 Proclamation and the revolutionary programme of the First Dail were abandoned and as occurred yesterday, occasionally resurrected by successive governments only for lip service. Sinn Féin warned, time and time again, that this government was mismanaging the economy. Let me make it clear: this mess is not the fault solely of Brian Cowen. It is the fault of successive governments and taoisigh. There was no proper utilisation of resources or proper investment in infrastructure, education, health. Ta se scannalach nach raibh pleanail na ullmhu don am le teacht deanta ag an rialtas. But this Government has been entirely and absolutely irresponsible. It has protected its wealthy friends in the banks, the developers and property speculators and the private health insurers. And it targeted the most vulnerable - the sick, the elderly and children. Let me also make it clear that Fine Gael would do no better. This is the time for new ideas, new thinking and real change. A time for new political leadership and a new vision for the future. Now is the time for a national conversation about the core values of our society; about how we as an island people wish to live our lives. Now is the time for the people of Ireland to work together - to draw upon our strengths, to share and create a common purpose based upon our rights as citizens and our pride and confidence in our country and its people. Now is the time once again for another great national revival of our language and arts, our culture. Now is the time to build national morale. Members of the First Dail knew the importance of using and reviving the Irish language - indeed the proceedings of the inaugural First Dail meeting were in Irish. Today, much work needs to be done to ensure that Irish survives and flourishes. It is the heritage of everyone in this country. There must be a focus on ensuring that the Gaeltacht areas are not undermined and that Irishlanguage education is supported across the island. D’fhulaing glun i ndiaidh gluine thar na blianta. Ta nios fearr tuillte againn anois. Those elected to govern must be guided by the vision espoused in this hall in 1919. They must plan for the future - not the next general election. The economic challenges before us are huge but they can be overcome with honest leadership and decisive action. The starting point must be stimulating the economy. It means putting in place measures to encourage economic growth, including economic strategies which invest in jobs, in people and in public services. This will require significant new funding. In the South, this will mean increasing state borrowing to fund capital projects and lowering consumption taxes (VAT) to boost consumer spending. Steps need to be taken to protect existing jobs, prevent home repossessions and generate economic growth. In the North, it means pressing the British Government for greater fiscal autonomy and the ability to raise taxes and manage our economy independent of British Treasury restraints. It also means ending the nonsense of two competing economies on this island with two administrations, two health services, two education systems, two investment bodies with separate strategies, two different tax regimes, and much more. Nil ciall ar bith leis an teorann graine sa domhan, san Eorap ina bhfuil muid inniu. An all-island economy makes sense. Ireland, North and South, needs a new joined-up economic strategy for the 21st century and for the new realities of today. Sheas mormhor na ndaoine leis an Phoblacht nocha bliain o shin. Today, as in 1919, I believe the majority of Irish people, support the objective of an independent and United Ireland. Sinn Féin is for a united Ireland. Sinn Féin is for the construction of a new national democracy - a new republic - on the island of Ireland and reconciliation between orange and green. Ta obair de dhith - nil se ag dul a tharlu gan sar-iarracht. Now is the time to promote a united Ireland as desirable, viable and achievable in this generation through peaceful and democratic methods. Republicans believe that the Union is a nonsense, even in these more enlightened times for unionists as well as the rest of us. Working people, the farming and fishing sectors, the working poor, deprived communities afflicted by real hardship and disadvantage, now know that being unionist matters little. The Union does not put food on the table or heat in the home. Under the Union, unionists make up fewer that 2 per cent of the Kingdom. They would constitute 20 per cent of the new Republic. They would be citizens, not mere subjects. They would have rights, not concessions. We have to persuade them of that. So too does the Irish Government. The British Government also has its obligations. But their obligations are of a different order. We are the nation builders. A key area of work in this will be reaching out to unionists and engaging with them on the type of Ireland we want to create. Our responsibility is to ensure that unionists are comfortable and secure in a new Ireland. It is their Ireland also. So it must be a shared Ireland, an integrated Ireland, an Ireland in which unionists have equal ownership. In seeking to achieve a united Ireland there is also a need to attract allies internationally and build on existing support. There are tens of millions of people across the globe who can proudly trace their lineage back to Ireland. The Irish Diaspora is strongest in the United States. I returned from there today. Ta an-speis ansin acu go foill. Yesterday, I attended the inauguration of President Obama. Irish-America’s strength was evident in that election and in the many politicians I met. Bhuail me lena lan sean-chairde thall ansin. There is considerable goodwill in the USA for a united Ireland. We have to mobilise and organise with our friends there to advance our goals. I want to welcome the President of the Friends of Sinn Féin, Larry Downes to our proceedings today. I am also pleased to announce tonight that, this summer, Sinn Féin will be hosting two major conferences in the USA. Sinn Féin will be inviting Irish-America to discuss with us how we can advance a united Ireland campaign. Our intention is to engage with the Diaspora and seek to marshal its political strength. The initial focus of the united Ireland campaign in England, Scotland and Wales will be to build towards a major conference in London early next year. unionists and others right across our offshore island - most recently in places like Leeds, Newcastle, Liverpool and Birmingham, as well as in London itself. Other work has been started and will continue this year in both Wales and Scotland. The planned London conference will not be the conclusion of this work - it will mark a stage in what must be a longer-term campaign. So there are lots of challenges ahead. But there is also great hope, not least because many, many people want a better Ireland. And they are prepared to work hard for that better Ireland. We have to harness that support and activism. Republicans have vision of a united Ireland, a free Ireland, an Ireland where prosperity and equality are delivered in equal measure. An Ireland in which Orange and Green can build a common future in co-operation and harmony. We have a vision of an Ireland at peace with itself and its neighbours. These are hard times for Ireland - North and South - though people in other regions have harder times. But in hard times we are especially called upon to come forward. The leaders of the Rising in 1916 or the First Dail were called upon. They had a sense of purpose. That is what Ireland needs today. Ireland needs citizens to step forward across this island to collectively shape a sense of common purpose. To do whatever we can to improve the lives of our people and our communities. We have a responsibility for each other and a responsibility to each other. The economic future of Ireland must be built on solid, secure foundations. It must be based on fairness and decency. Ta dushlan romhainn uilig, ta Sinn Féin ag obair ar son agus ag ullmhaigh fa choinne Eire, soar agus aontaithe. On this 90th anniversary of the first freely-elected parliament of all the Irish people, I invite you to join with us in building that new and better Ireland for the 21st century.